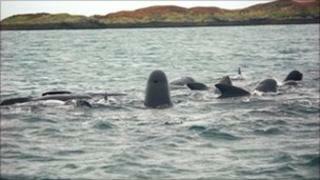 A group of whales in danger of becoming stranded off the coast of South Uist continue to be monitored. The Scottish SPCA said the 24-strong pod of pilot whales are currently swimming freely in the bay at Loch Carnan, but the threat of stranding remains present. The whales were first spotted near the shores of Loch Carnan on Wednesday. The Scottish SPCA and British Divers Marine Life Rescue (BDMLR) launched a rescue operation on Thursday. Members of the public had seen the animals close to shore. Two teams of volunteers, including 10 medics from BDMLR and three inspectors from the Scottish SPCA, travelled from the mainland to the site, taking three vehicles, two rescue trailers and four sets of rescue pontoons. The rescuers have also enlisted the help of Project Jonah, the New Zealand-based marine mammal rescue organisation which has experience in mass whale strandings and will be providing advice over the phone should a stranding occur. Scottish SPCA senior inspector, Andy Brown, said, "After treacherous weather conditions overnight, we are relieved to report that although the pod of whales are still in the bay, they are swimming freely and have not yet stranded. "There are several juveniles in this group and they all seem to be quite happy at the moment. "We are privileged to see these animals up close, but we are also very aware that the threat of stranding remains, which would, of course, be disastrous. "We will continue to monitor the whales throughout the day, ready to act should the danger of stranding become a reality."